Examples, solutions, videos, worksheets, stories, and songs to help Grade 5 students learn how to classify quadrilaterals. A quadrilateral is a figure with four sides and four angles. Some examples of quadrilaterals are parallelograms, rhombuses, trapezoids, rectangles and squares. 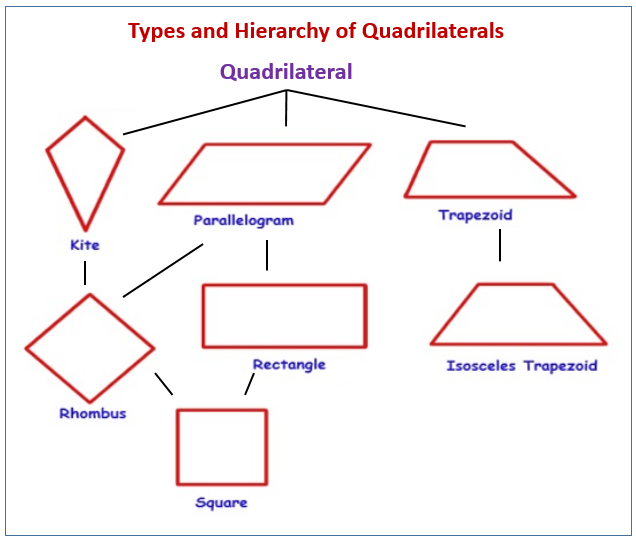 The following diagram shows how quadrilaterals can be classified. (In this diagram, a trapezoid is defined to be a quadrilateral that has exactly 2 parallel sides. If a trapezoid is defined as a quadrilateral with at least 2 parallel sides then it will belong to the parallelogram category). Learn to classify quadrilaterals: Parallelograms, Rectangles, Squares, Rhombuses and Trapezoids. They are closed shapes. They have straight sides. The ends are together, but they don’t cross. Pay attention and you won’t get lost. We can classify, like a family tree. Kites, kites, in the tree by themselves. No parallel sides, poor kites. Oh well. But they gotta’ touch for a kite to fly. Hey, you know Ben Franklin? He flew one of these. They sit in the tree on a lonely little stem. There are no others, quite like them. One pair of sides that are parallel. The parallel sides, why those are the bases. In our family tree on their own oasis. Holding up the base like two little pegs. Got yourself a trapezoid. It’s not time to stop. Ready for the rest now? Let’s hear you sing along. That are parallel, and the same size. They have a lot of properties that are unique. If you knew them all, you’d be a Geo-Freak. Three shapes to go before your vacation. That’s what makes me a great big fan. Our last three shapes are a type of parallelogram. If you don’t learn them, you’ll fail the exam. Next to the rectangle is where it resides. Put them together and say a little prayer.